On Monday, May 9th, 2016, a transit of the planet Mercury will take place. The tiny planet will travel across the face of the Sun. Mercury transits are rare events which can be observed from much of the world, however, since they involve viewing the Sun, extreme caution must be taken when attempting to observe them. NEVER look directly at the sun with the unaided eye, binoculars or telescopes unless they are equipped with special solar filters and supervised by an educator or experienced amateur astronomer. One of the easiest and safest ways to observe this rare event is online via a live web feed. 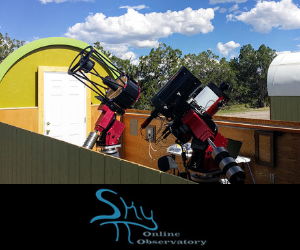 Insight Observatory will be broadcasting a live web of the transit courtesy of Sky and Telescope Magazine's Livestream channel. 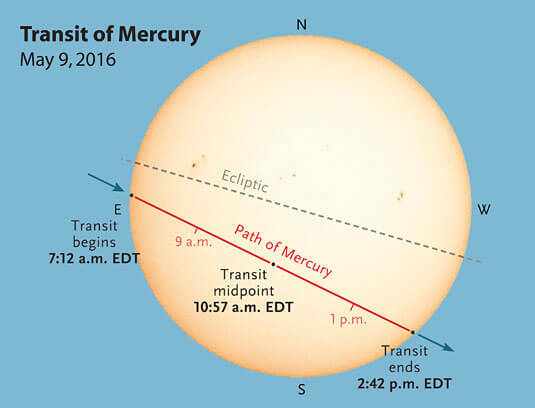 You can watch the progress of the planet Mercury crossing the Sun's disc on our website at http://www.insightobservatory.com/p/real-time-astronomical-event.html. 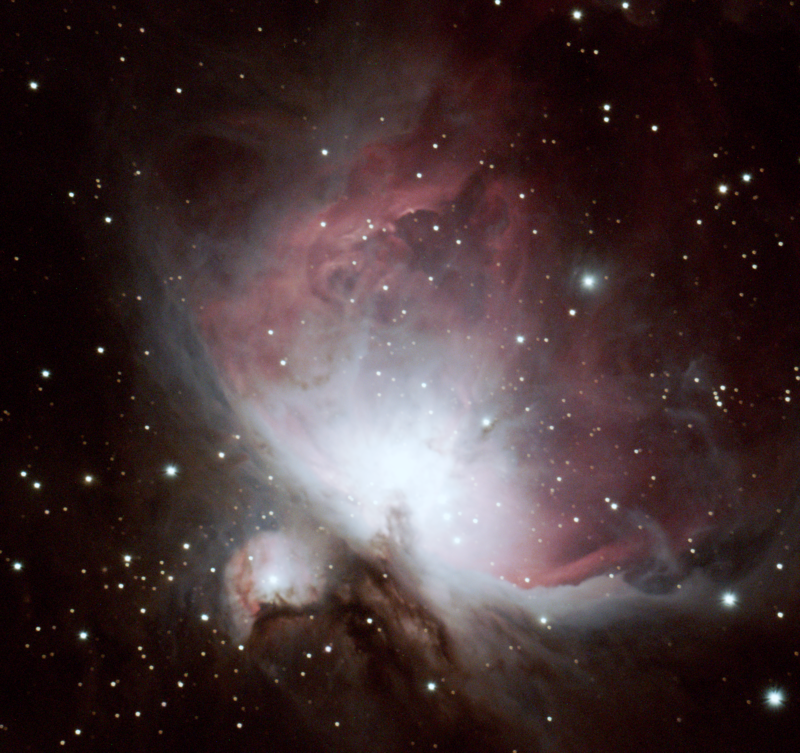 Sky and Telescope Magazine Diagram. During this transit, the planet Mercury is seen as a tiny black dot moving slowly in an East-to-West direction across the Sun. The 2016 transit begins on May 9th at 11:12 UT (Universal Time, which is equivalent to Greenwich Mean Time) and ends later that same day at 18:42 UT, with mid-transit taking place at 14:57 UT. Here in the northeast, the event begins at 7:22 am with the transit midpoint at 10:57 am and ending at 2:42 pm. 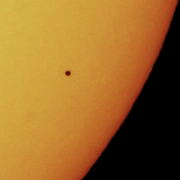 If you’re in western North America, the rising Sun will already display Mercury’s black dot. Easterners and many Western Europeans will be able to watch the entire transit, weather permitting, from Mercury’s first sign of visibility onto the Sun’s face to its final disappearance 7½ hours later. For the rest of Europe, Africa, and most of Asia, the transit also begins in the daytime but will still be underway when the Sun sets. Observers in Australia and eastern Asia will just have to watch online as it will not be visible to those parts of the globe. For more detailed information on of the Mercury transit, please visit Sky and Telescope's article covering the event. Mercury is the smallest planet, therefore, you'll need a telescope to observe its transit. The black silhouette will appear only 12 arcseconds wide even though Mercury is at inferior conjunction. That’s about 1⁄160 of the Sun’s width and only a fifth the diameter (and 4% of the area) of Venus’s dramatic black disk during the rare transits of Venus. When first viewing, you might mistake Mercury for a small sunspot. It’s precisely round and lacks a gray penumbra. As Mercury travels across the Sun’s vast expanse, how readily can you see its motion? If it passes near a sunspot, can you see that it’s darker than even the sunspot’s umbra? When Mercury departs at egress, the sequence of phenomena at ingress unwinds in reverse order. After a May transit, a November transit always occurs 3.5 years later (for instance: May 9, 2016, and November 11, 2019). Transits recur on nearly the same date in cycles of 46 years (for instance: May 9, 2016, and May 10, 2062). November transits, which are more common than May transits, occasionally recur in periods of 7 years, and more frequently in periods of 13 and 33 years. If you simply can’t catch 2016’s Mercury madness, make sure to mark your calendar for the next mercury transit on November 11, 2019. After that, you’ll be waiting until 2032.